Hi friends, Nowadays the IPL 2018 is going to be so popular and all the Cricket Fans are enjoying this season superbly. However, as a result of this, Reliance Jio offering 112 GB free data and free IPL Live Streaming. So friends, if you want to know, how to get this free 112 GB data as well as Free IPL 2018 Live Streaming then read this article. Here in this article, I briefly explained how to get this free 112 GB data and how to watch Free IPL 2018 Live Streaming. Recently, we all know that, IPL just give us to expand the free Prime Members Subscription. And now Reliance Jio offering 112 GB free data and free IPL Live Streaming. So friends, don’t waste any more time, let us get started. Recently Jio launches a New offer and the name of this offer is “JioPhone Match Pass” and if a new subscriber will get this JioPhone Match Pass offer then that subscriber will get upto 112 GB free data and also free IPL 2018 Live Streaming on JioTV with the help of Hostar. Now friends, I know that, at this time, you are thinking that, “what is the Validity of this Plan?” so don’t worry friends, I am telling to you. Here the Validity of this new offer (JioPhone Match Pass) is 56 days. What is “JioPhone Match Pass” offer? JioPhone Match Pass offer is very simple. In this offer, you just have to recommend or referral the JioPhone to your family members or friends and hence as a result of this, if she/he will buy JioPhone on your link then you will get 112 GB free data and the limit of this free 112 GB data is 2 GB. This Data will depend on yourself i,e how much you recommend this offer and how many users will buy from your link. 8 GB free data will be activated when your first 4 recommended users will buy a JioPhone and the validity of 8 GB free data is 4 days. When your fifth recommended user will buy a JioPhone then you will get 24 GB free data and the Validity of this offer is 12 days. When your other four recommended user will buy a JioPhone then you will get again 8 GB free data and the Validity of this offer is 4 days. So friends, this Data will depend on yourself i,e how much you recommend this offer and how many users will buy from your link. If you want to Avail this Offer “JioPhone Match Pass” then first Your recommendation friends or family will first need to call the toll-free number which is here ====>>> 1800-890-8900 and after that enter your Jio number and then enter your area PIN code. After this, your recommendation friends or family can either visit a Jio retailer or Jio’s website to purchase the device. 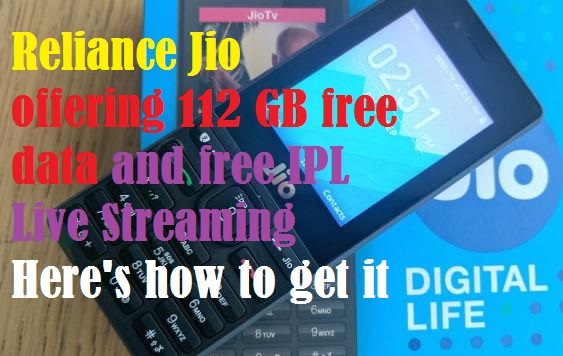 So friends, In this article, I told you “Reliance Jio offering 112 GB free data and free IPL Live Streaming, What is “JioPhone Match Pass” offer? , How this “JioPhone Match Pass” offer works and How to Avail “JioPhone Match Pass” offer works And if you have any query about this, then put your question in comment section. I will reply your comment as soon as possible and thanks for reading this Article and also share this article with your friends and family. Must Follow us on your social networks.